The motion was rejected with six in favour, 11 opposed and one abstention. It called on the government to allow a mediator to impose a final agreement in negotiations with the Union of Northern Workers. A Yellowknife MLA's motion calling on the territorial government to move to binding arbitration has failed by a vote of 11 to 6 against, with one abstention. Yellowknife Centre MLA Julie Green tabled the motion Friday. It called on the government to allow a mediator to impose a final agreement in negotiations with the union this weekend. 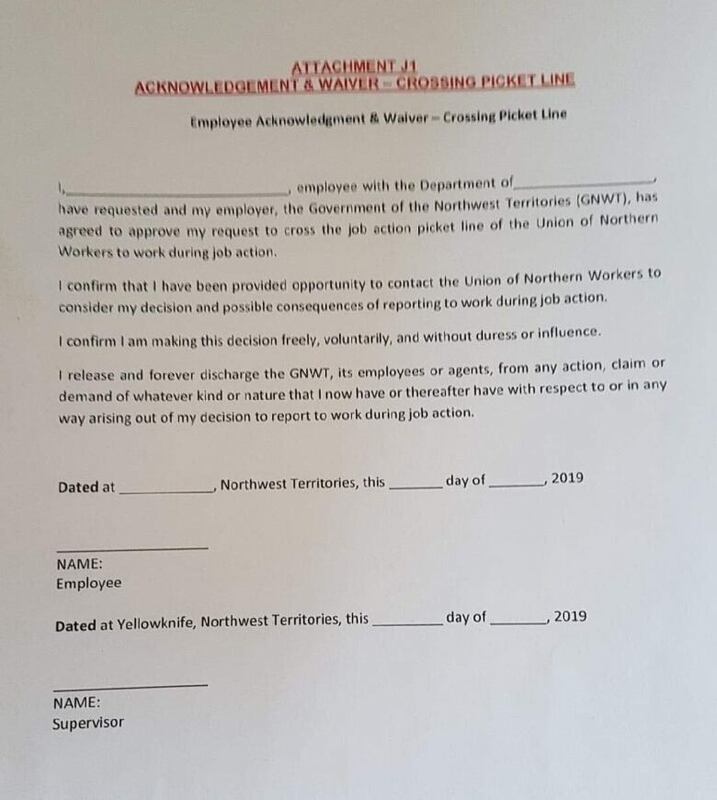 On Tuesday, the Union of Northern Workers (UNW) said it will strike at 12:01 a.m. on Monday if an agreement is not reached in mediations with the territorial government this weekend over a new collective agreement. The unionized employees have been without an agreement since 2016. The motion was rejected with six in favour, 11 opposed and one abstention. MLAs Kieron Testart, Shane Thompson, R.J. Simpson, Frederick Blake Jr., Kevin O'Reilly and Green voted for the motion. Tom Beaulieu, MLA for Tu Nedhé-Wiilideh, abstained. Many MLAs said they were frustrated that the motion was tabled Friday, before the mediation finishes on Saturday. MLAs said now it is not an option to table this motion if the union strikes. "How can we ask the government to give up their right to negotiate?" asked Thompson, MLA for Nahendeh. "How can we ask the union to give up the right to strike?" Finance Minister Robert C. McLeod said he wanted to stress that "just because you voted against the motion doesn't mean you want a strike." After the vote, Green told reporters she is "really disappointed with the outcome." Green, who earlier in the house said she had "lost confidence" in the negotiating process, said the motion was "only ever going to be advice to the government." "We thought today was the day they need it," she said. "If they decide to go into arbitration, they don't need a motion from us to do that." In a news release, union president Todd Parsons expressed support for Green's motion and said it will "actively oppose MLAs who stand with the premier and reject today's motion." The union release also took aim at waivers sent out to some government employees Thursday that would allow employees to cross picket lines in the event of a strike. "In the past weeks the government has gone from sending out false information about their pay offer to actively encouraging employees to turn on their own union," said Parsons in the release. In a subsequent release, the union said it would respond by offering employees involved in "strategic strike activities" 60 per cent of their gross salary, instead of the "previously announced strike pay of $117 a day." Strike pay is paid to union members who have participated in strike activities, like a picket, for at least four hours in a day. According to the union's governing documents, this increased rate of pay could only be paid for two weeks maximum and to 10 per cent of the union's total workforce without executive approval. In the Legislature Friday morning, MLAs questioned Finance Minister McLeod about the waiver. Green said the waivers were "further enflaming" an already volatile situation. In his response, McLeod said the waivers were "providing information." "I'm hearing from people that are wanting to know, 'How am I going to pay my mortgage? How am I going to look after my three children?'" said McLeod. "We have to give people the right to choose." Testart, MLA for Kam Lake, called the document "very suspicious" in a scrum with reporters. He said the document does not meet the "visual guidelines" for territorial government documents, though added McLeod's statements "did confirm that those documents were being sent out." "I did not hear the minister question the authenticity of the document," said Testart. About 30 students from Aurora College were at the legislature Thursday calling on the territorial government to consider binding arbitration. If employees go on strike Monday, Aurora College campuses and Community Learning Centres will close and classes will be cancelled. The territorial Department of Education said the college would make up the cancelled classes, but some students said they would resort to independent studying to keep up with course material. Students "want to go in and actually practise and work with these patients and clients and we can't," said Samantha Morandin, student association president for the college's Yellowknife campus. Morandin has written a letter calling on the government to resolve the conflict with the union. She said she and other students "understand binding arbitration at this point is the only way to be certain to avoid a painful and damaging strike." Some students say they feel caught in the middle. "We're negatively impacted overall," said Seiji Bullock, nursing student and student association vice-president. "Part of us wants to stand with the union, some of us want to stand with the GNWT, some of us don't know what to do. "Really, come Monday, we just stay at home."